eXist Solutions GmbH released eXist LTS version 2.1.6. Since the introduction of Long Term Support (LTS) in January 2014 this is already the 6th quality release of cherry-picked improvements and enhancements. eXist LTS addresses the needs of enterprise-scale users that require a reliable and supported version of the open source version. eXistdb is a full-fledged NoSQL application server that combines a powerful database with packaged applications, a browser-based IDE and all tools to manage and support the application lifecycle. As a rapid web-development platform eXistdb offers a fine-grained security model, templating, a REST and WebDAV interface and the capability to store any kind of data without applying a schema to the database. A rich set of extensions allow to use features like pdf- and chart-generation, a powerful forms framework, access to SQL databases and many many more. eXistdb offers the building blocks to build modern, responsive mobile-ready applications in less time. Apart from various bug fixes, LTS 2.1.6 focuses on query performance and improvements to the backup system. 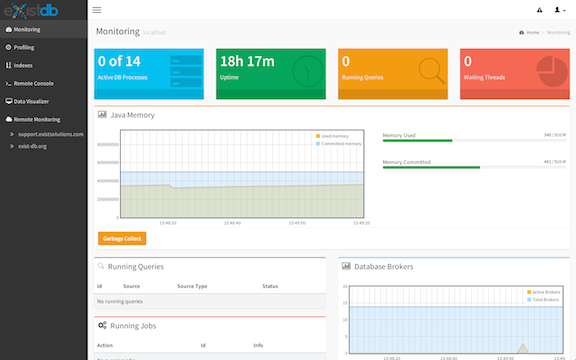 2.1.6 also introduces the new 'Monex' application for monitoring and profiling remote or local servers. eXist LTS is available as a subscription at http://exist-db.org.